Surprise the Mother of the Bride to be with our lovely stationery gift box, a useful and delightful wedding planning gift! When there is a wedding to plan you can never have too many notebooks and other beautiful stationery. This super stationery set makes a thoughtful gift this Christmas. 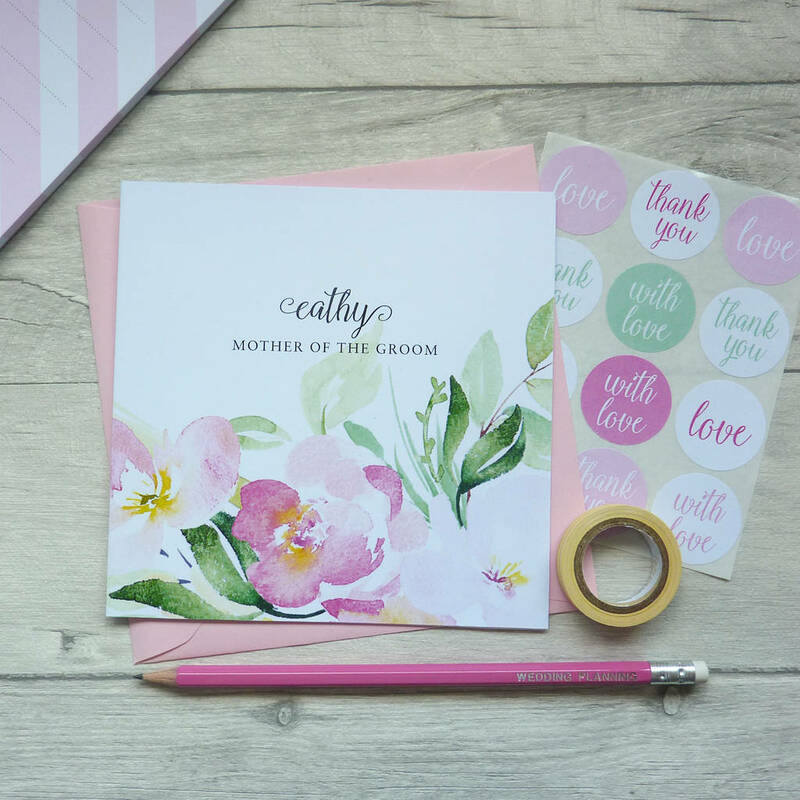 Each stationery set is supplied in a stylish box with a personalised belly band showing the name of the Mother of the groom along with a short personalised message. 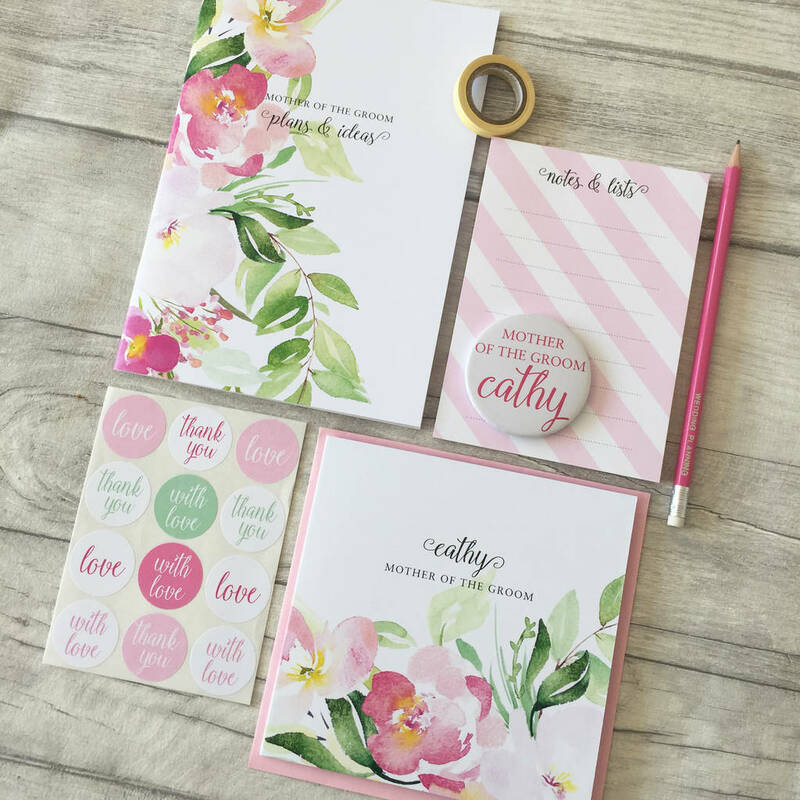 This stationery gift set is perfect as a thoughtful gift. The box can be kept after the planning is all done and makes a lovely keepsake. An A5 notebook with a lovely floral design on, perfect to pop into your handbag. A handy note pad with tear off pages in a modern stripe design, great for list making. A very stylish bright pink pencil with "WEDDING PLANNING' printed on in silver. A roll of colourful washi paper tape (colours and patterns will vary). 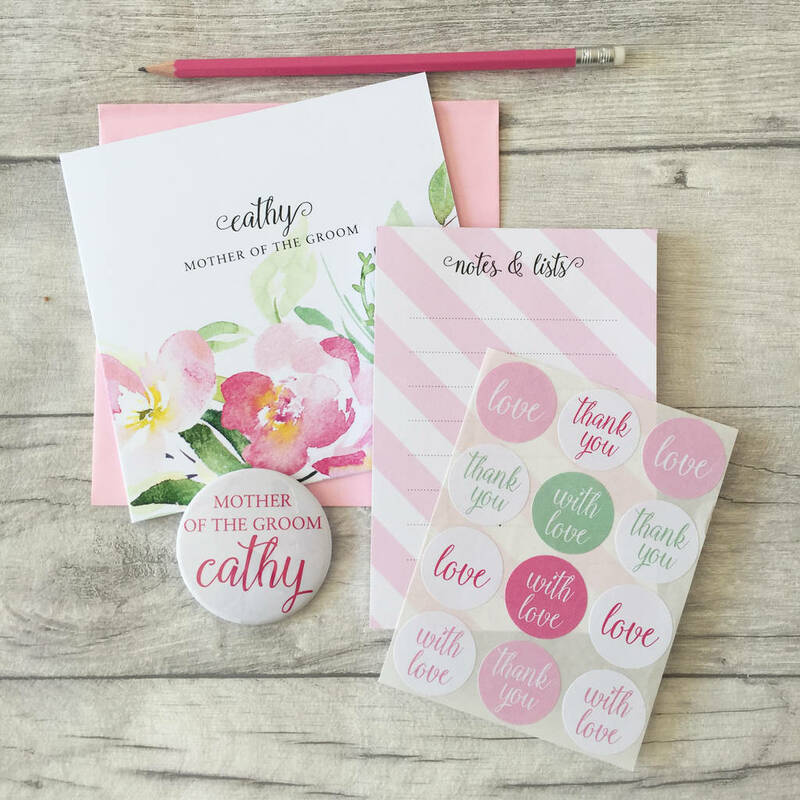 A fun badge with "MOTHER OF THE GROOM' on and personalised with the name of the mother of the groom in hot pink text on a white background. 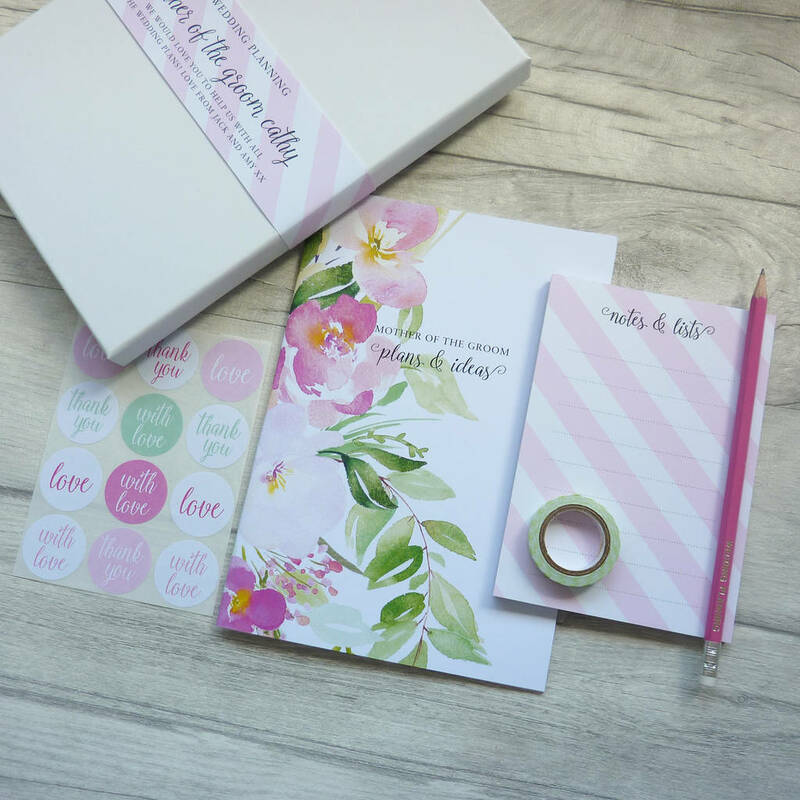 A set of 24 'love' stickers, great for adding to envelopes and jazzing up letters and notes. 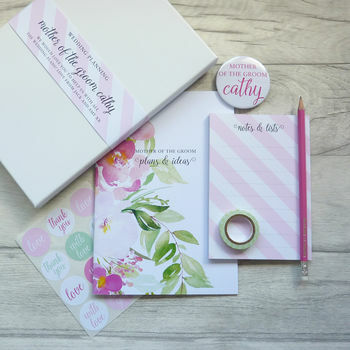 With matching boxes for Brides, Bridesmaids, Maid of Honour & Mother of the Bride everyone invloved in the wedding planning can have one, please see our shop for more details. Each notebook has a 350gsm cover and 36, 90gsm blank white pages inside. Each notepad has 50 sheets of 100gsm uncoated recyced paper and is glued along the top edge with a grey board backing sheet. Cards are printed on 350gm smooth white card. Stickers are supplied sheets of 12 stickers x 2 sheets per box. Badges are plastic with a metal pin fixed to the back. 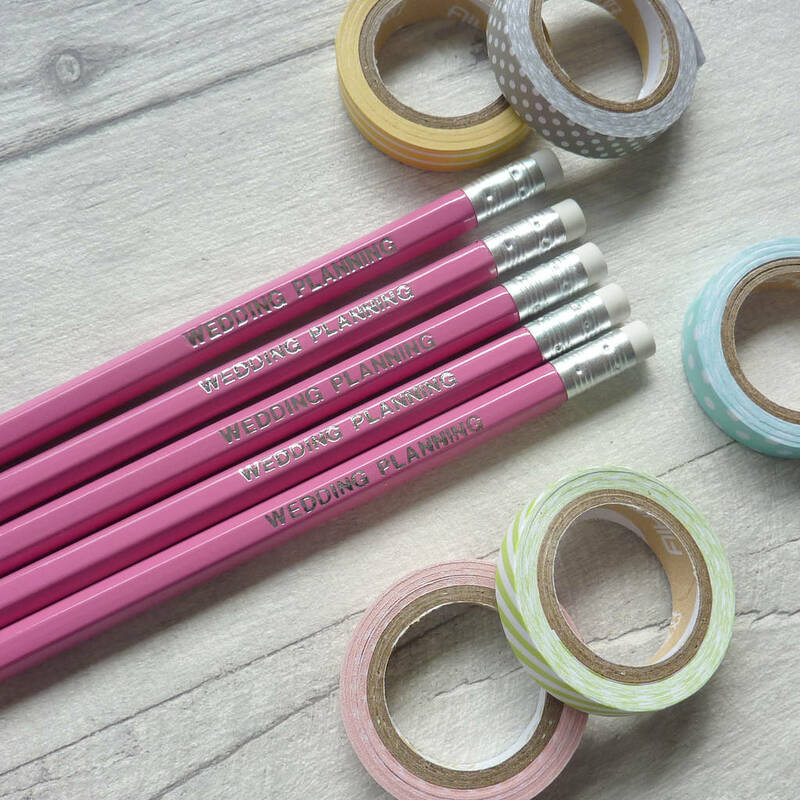 Pencils are a standard wooden style printed with 'WEDDING PLANNING' in silver and with a rubber on the end. The decorative washi tape is made from paper. Note books are A5 sized, 14.8cm wide x 21cm high. Notepads are A6 sized, 10.5 cm wide x 14.8sm high. Each badge is 58mm wide. Washi tape is 8mm wide x 5m long.